A highly classified military spy satellite, known by the code name “Zuma,” has gone missing after its launch aboard a SpaceX rocket on Sunday. The satellite was launched aboard a Falcon 9 rocket from the Cape Canaveral Air Force Station in Florida, but it reportedly never made it into the atmosphere after it separated from the rocket during the latter stages of ascent. Bloomberg News reported that three officials – a U.S. official and two congressional aides who know about the project – said the “second-stage booster section” failed and the satellite was lost, while the second-stage rocket fell back into the ocean. The satellite is reportedly worth billions, and the U.S. Defense Department contracted with Northrup Grumman Corp. to commission the satellite launch contractor. Elon Musk’s Space Exploration Technology Corp., or SpaceX, was selected. Northrop spokesman Tim Paynter told Bloomberg that the company “cannot comment on classified missions,” and the Pentagon referred any questions to SpaceX. SpaceX spokesman James Gleeson told Bloomberg via email that the company doesn’t “comment on missions of this nature; but as of right now, reviews of the data indicate Falcon 9 performed nominally” – meaning the rocket’s navigation system and engines went off without a hitch. However, U.S. Strategic Command (STRATCOM) said it wasn’t tracking any new satellites following the launch. “We have nothing to add to the satellite catalog at this time,” STRATCOM spokesman Navy Capt. Brook DeWalt told Bloomberg via email, when asked if the satellite was orbiting. So what might have happened to the expensive, secret military spy satellite? It could have been a problem with the launch, but the Zuma satellite could also not have separated properly, which would have prompted its plummet back to earth. SpaceX’s Falcon 9 rocket has an engine that, once it stops, is supposed to prompt a separation where the rocket continues on its own trajectory, and whatever the rocket was carrying takes off on a separate trajectory. In this case, that would be the Zuma satellite. If separation fails, one or both components could end up right back where they started. 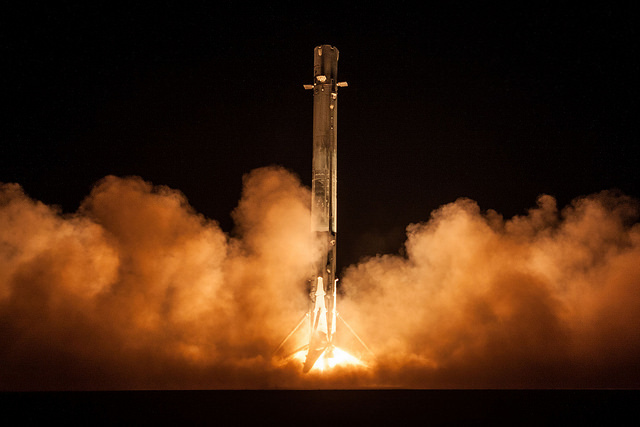 While the satellite’s whereabouts currently remain a mystery, SpaceX reported that the rocket’s first stage landed successfully, which means it can be reused in future launches. The Wall Street Journal reported that Zuma’s launch was initially slated for mid-November, but that SpaceX wanted to delay the launch in order to examine data from a fairings test. Fairings are protective satellite coverings, especially to protect satellites that might be near the front, or nose, of the rocket. Fairings, too, are discarded before any object’s final insertion into orbit – in this case, what would have been the Zuma satellite.